Teenager Nathan Seal is back to his college studies this week after an outstanding performance in the Daily Express Junior European Open Championship in Spain. The Knaresborough 17-year-old, who plays off three, finished tied 11th from a field of more than 100 entrants, having fired five consecutive rounds in the 70s in fiercely windy conditions at the Alcaidesa resort in Andalucia. And, but for an untypical disaster at a par five in the final round - when he lost two balls in the gorse and rough - he could have secured a top ten finish. To make the cut for the final match, players had to card 156, based on the best two scores of the week, and Nathan easily graduated with a combined 150 with scores of 76 and 74. His father Paul, Knaresborough’s junior co-ordinator, caddied for Nathan in the finale at Finca Cortesin. 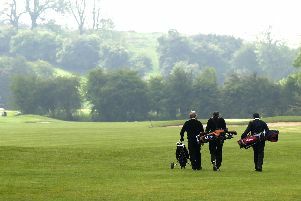 Paul said: “You had to be there to appreciate just how windy it was and to see the speed of the greens. Nathan, who is studying sports science at Myerscough College in Lancashire, was more than pleased. The golfer said: “On the whole, I missed nothing from inside six feet on the greens, which were very fast. After Nathan leaves college next year, he hopes to gain his pro golf status through the PGA training programme.